Despite its unfortunate association with the Khmer Rouge, Cambodia is today, one of the most tranquil vacation spots you might ever see. 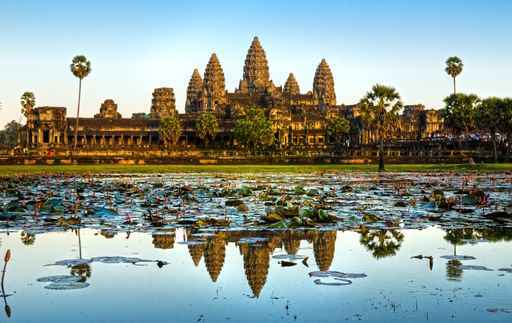 The beguiling Angkor is a fixture on every holiday maker’s itinerary and with good reason. The massive religious complex with the Angkor Wat temple still standing guard over the ruins is truly an awe-inspiring sight. Don’t rush your visit because the magical beauty of the intricately designed Banteay Srei or the magnificent faces of the Bayon will surely make you lose track of time. In the capital city, the Silver Pagoda, as well as the Royal Palace, are great attractions for all tourists. If you want to take in all of the Khmer temples in one sweeping panorama, the Preah Vihear situated on a cliff in the Dangrek Mountains is the perfect spot. The floating villages around the Tonle Sap, Cambodia’s large freshwater lake is another interesting sight to see. The lake may look dramatically different at different times of the year as the volume of water increases and depletes. If you love sea life then a visit to Kratie should be on your list. If you are lucky you can catch a glimpse of the Irrawaddy dolphin which is, sadly, dwindling down to extinction. Finish up your visit at Koh Ker, an ancient capital of the Khmer empire where you will find the imposing, pyramid-like Prasat Thom that dominates the landscape.